Ali (not real name) is 24 years old. This is his story. In November 2011, Ali noticed “floating” veins in his chest. His face was swollen. He was admitted to a private hospital. A CT scan showed a mass in his chest. A biopsy confirmed a mediastinal germ cell tumour. Ali subsequently undergo 4 cycles of chemotherapy using BEP regimen (Bleomycin + Etoposide + Cisplatin). His AFP (alpha-fetoprotein) decreased following the treatment. In spite of that, the surgeon was unable to operate on Ali because the tumour was found to grow around his heart. Instead of surgery, Ali had to do 30 sessions of radiotherapy. Unfortunately, radiotherapy did not help much. In March 2014, Ali went to London to undergo a nanosurgery. According to the English doctor, this procedure would help Ali. Indeed after the surgery, the AFP decreased, but later the AFP increased again. Ali returned to Malaysia and underwent another 4 cycles of chemotherapy using TIP (paclitaxel + ifofamide + cisplatin). TIP regimen is a second-line salvage chemotherapy for patients post-BEP. 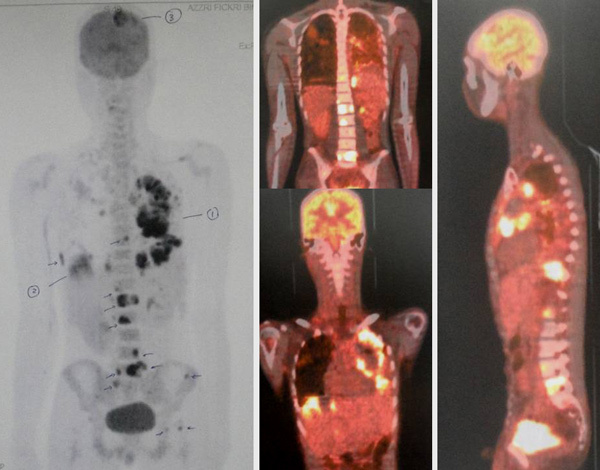 His AFP decreased after TIP but the size of the tumour remained the same — 4.3 cm. The tumour size before any treatment was about 8 cm. Ali consulted another oncologist. Since nothing much could be done, the doctor recommended that Ali go to Germany for hyperthermia + chemotherapy treatments. Ali stayed in Germany for about a month undergoing that treatment which cost about RM 80,000. Ali returned to Malaysia and continued with the hyperthermia and high dose chemo. He had been on this treatment for almost a year now. His AFP decreased but the size of the tumour stubbornly remained the same. Ali again started with another round of chemotherapy using Avastin + Gemzar + Taxol and Oxaliplatin. This treatment made Ali real sick. He needed a blood transfusion. In addition, he started to cough out blood. His AFP shot up to 24,591, as on 5 February 2015.
extensive malignant lesions present in the left lung, less in the right lung. several metastases present in the bones. a large nodule about 4.5 cm in the right lobe of his liver and a few small ones. a lesion about 4.0 cm in the parietal region of his brain. In March 2015, Ali and his parents came to seek our opinion. I felt empathy sitting in front of this young man listening to his sad story. I admitted that there is nothing much I could do. It would be wrong to believe that our herbs could solve his problem. Even more so, after all that modern medicine could offer had failed. In writing this story, I am reminded of what Drs. Jerome Groopman and Pamela Hartzband wrote in their book, Your Medical Mind about the many types of patient’s mindset. Some are naturalism orientated believing that the body can often heal itself if given the proper environment, harnessing the mind-body connection and supplementing with herbs, vitamins, and other natural products. On the opposite end of the this spectrum is the technology orientated believing that cutting-edge research yielding new medications and innovative procedures holds the answers. Some people are profoundly proactive about their health, believing that more is usually better. In contrast, those with a minimalist mind-set aim to avoid treatment if at all possible, and if not possible, they try to use the fewest medications at the lowest possible doses or to select the most conservative surgery or procedure. Minimalists hold to the notion that “less is more. Believers approach their options with the sense that there is a successful solution for their problem somewhere. Doubters approach all treatment options with profound skepticism. They are deeply risk-averse, acutely aware of the potential side effects and limitations of drugs and procedures. If patients come to see us hoping to find some kind of magic bullet, then it would be most disappointing to know that we have none. We try to help you the best we know how but we need your commitment to help yourself first. You need to have the right kind of mindset first. It was indeed sad to note that he had submitted to the last round of chemo with Avastin + Gemzar + Taxol and Oxaliplatin., resulting him to cough out blood. One wonder, what did you expect to get from such treatment when earlier treatment did not work? Then, the bleeding. What caused this? Click this link: http://www.avastin.com/patient. Most serious side effects: GI perforation: A hole that develops in your stomach or intestine. Symptoms include pain in your abdomen, nausea, vomiting, constipation, or fever. Wounds that don’t heal: A cut made during surgery can be slow to heal or may not fully heal. Avastin should not be used for at least 28 days before or after surgery and until surgical wounds are fully healed. Serious bleeding: This includes vomiting or coughing up blood; bleeding in the stomach, brain, or spinal cord; nosebleeds; and vaginal bleeding. If you recently coughed up blood or had serious bleeding, be sure to tell your doctor. BY DOCUMENTING THIS STORY IT IS OUR HOPE THAT YOU OR YOUR LOVED ONES CAN LEARN SOMETHING MORE THAN JUST “GOING TO THE DOCTOR OR HEALER” TO SEEK TREATMENT.